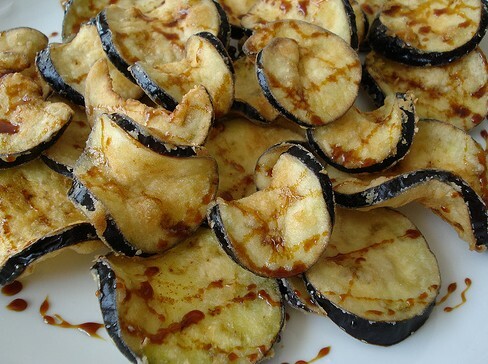 The first time I tried the crunchy deep fried slices of egg plant with honey vinegar was just after I was rescued by the Spanish Navy in Cartagena . I was having a pretty hard time back then, as I thought I was going to spend a long winter night in the woods. Actually I am not sure if I was more afraid of the darkness, lack of food or not being able to recharge my iPhone. Having been brought back to the city I like rewarding myself with something really delicious and unhealthy (for example fried bacon strips witch chocolate). Yes, I know I might be having some kind of a mental issues…rewarding myself every time I score in something or do a good job!?. Maybe it’s my mother’s fault who would always give me a sweet gift every time I got an A on my exam. Or maybe it’s my grandmother’s fault who would always tell me not to eat sweets in order to keep my figure (note: I was only 10 when I first heard it). You see, I am being confused all my life! In a normal situation, a deep fried egg plant wouldn’t be my first choice as I try very hard to cut down on fried food. Well, I am only a human and I really can’t resist the amazing Spanish food. I couldn’t help myself and I ordered a big portion of the most unhealthy delicious fried veggies I have ever tried. And a pint. Cold beer and deep fried food are like Spanish politics and bribes, there is a strong (unbreakable)bond between them. The egg plant was chopped into thin slices and deep fried. Each slice looked like a high quality potato chip. A sweet dark honey vinegar was poured all over the plate. It was served in the right moment, the egg plant slices were still tepid but not hot. So we could eat them using only our fingers. Actually that’s the only good way to handle it as the slices are so thin that using a fork might destroy the beauty of the plate. Casa Lucio, the emblematic restaurant of Madrid.